Only meat blokes like me will ever understand that every day is a great day to eat meat! Although meat cuts will do, I love getting my hands on deli-style cuts of meats. But, I’m also not into going to my local meat shop every day! Why pass by a deli when you can have it in your kitchen— fresh and expertly cut, right? As much as I believe that food preparing and cooking is a form of art, there are just some things that are best left to machines. Sure, a machine will never be able to cook a dish as I can, however, when it comes to preparations such as food slicing, I am all for turning the engine on! Why would you spend your energy and time slicing a piece of meat manually— a process that is both tiresome and prone to injury— when you can just turn something on, a little push and voila— perfectly cut meat with style! And that something is called a meat slicer! Meat Slicer: What Is It and Is It For? 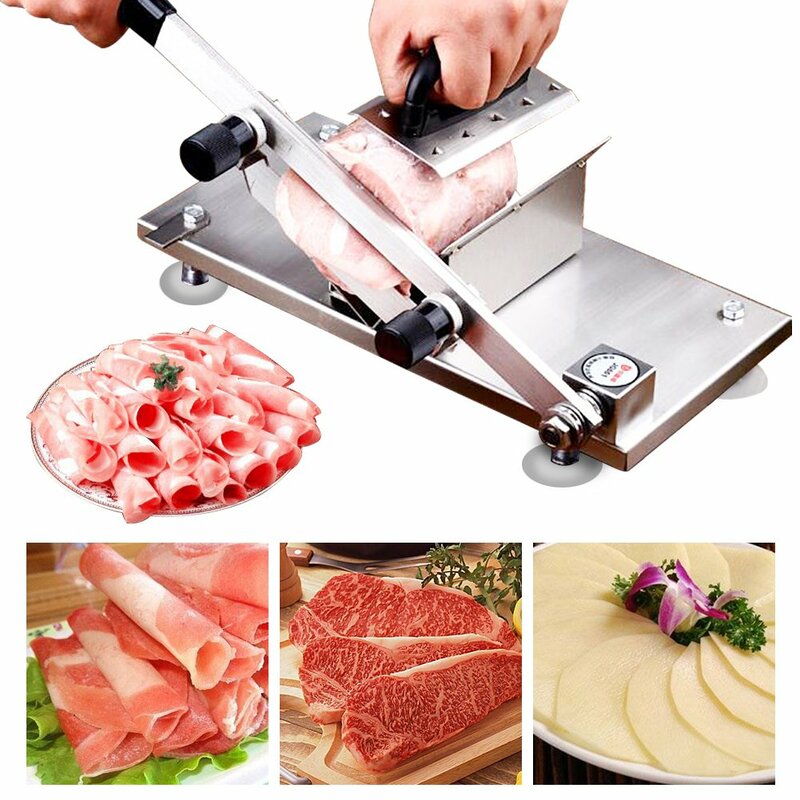 Originally, meat slicers are invented to perfectly cut any type of meat. However, most people also use the machine for slicing other types of food such as bread, cheese, vegetables and anything you need slicing. What is the meat slicer for? It is for making your life in the kitchen a lot easier! Manual slicing is a tiring process and can provide inconsistent results. And in such a fast-paced world we are living in, a meat slicer can save you valuable time that you can later spend with your loved ones. As I have mentioned before, manual cutting is a tedious job and extremely tiresome. Also, cutting through frozen meats can be quite troublesome. Not for meat slicers, though! With this powerful machine, meat cutting is as easy as 1, 2, 3! Because you are using a machine, you can expect even, uniform cuts you see in meat shops. This makes the food look more presentable. Also, the best meat slicers come with adjustable knobs to produce your desired thickness of food slices. Now, you can create Japanese dishes that require thin slices of meat. I already told you that meat slicers are not just for meats. This is why some people like to call it a food slicer, rather than meat slicers. It can cut through vegetables, fruits, cheese and more! Meet slicers need to have a sturdy and strong housing which is made from high-quality materials such as aluminum alloy, die-cast aluminum, stainless steel, premium coated steel or a combination of these materials. Other than being sturdy and durable, these materials are highly resistant to rust. Aluminum is typically lighter, while meat slicers constructed from premium coated steel or those with bigger aluminum alloy housing can be heavier and bulky. When buying a meat slicer, you want to make sure that it has enough power to cut whatever meat you have. In general, there are two different types of slicers— belt driven or gear driven, or a combination of both. Belt driven meat slicers usually lack the real power, so if you are planning to slice harder meats or bigger slices, then consider getting a gear-driven meat slicer. But, if you are looking for a simpler in-home slicer, then a belt-driven meat slicer should do just fine. Plus, this type of meat slicers is usually quieter and perfect for thin and softer meats. In terms of the blade, you get two choices— a smooth edge blade or a serrated blade. Smooth blades work best on lean meats and vegetables, providing you with cleaner cuts. You need to avoid crusty bread and tough meats with a smooth blade, though. For serrated blades, slicing bread and tough meats are easy. They can also cut through veggies, but, can leave a messy edge. But, if you want the best of both worlds, then it would be best to get a secondary blade to switch in and out. All meat slicers have an adjustable thickness that is usually controlled by a knob or dial on the machine. In general, the lower the number means a thinner cut, whereas a higher number means that you will have a thicker cut. However, such numerical system can vary from brand to brand. In order to help you slice frozen meats, the handle you use to slice meats is important too. Therefore, look for one with a large handle, a dual handle system or a fixed device handle which can make your slicing process a lot easier. In general, the blade of a meat slicer needs to be exposed as little as possible in order to prevent accidents. Look for a meat slicer that comes with a hand or knife guard that should act as a barrier between your hands and the blade. This feature prevents accidental startups. This feature, however, can be annoying and inconvenient depending on the slicer model you choose. So, if you are vigilant with where you are using the meat slicer and where you store it, this feature is not really necessary. Meat slicer should have rubberized feet in order to bring stability to the whole machine when cutting meat and avoid any accidents. Blade lock functions are highly common, particularly for meat slicers. A blade lock should prevent the slicer blade from moving unintentionally, which is great if you are storing the slicer within reach of kids. Meat slicers are fairly large appliances. Sadly, they do not break down for easier storage. So before buying, make sure that you choose one that can fit inside your kitchen cabinets. As you slice veggies or meat, will you be able to hold a conversation with the people next to you? 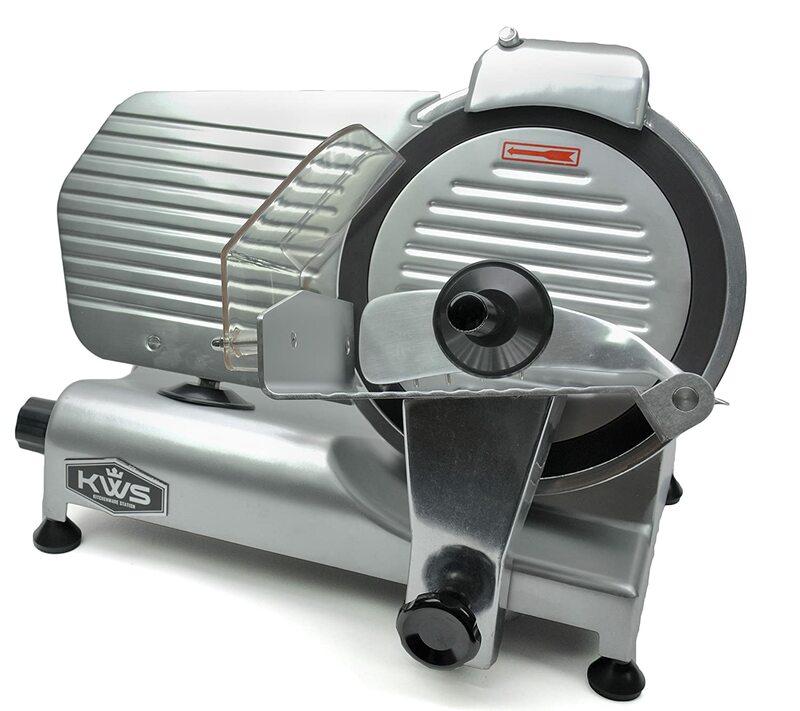 Most meat slicers have a noise level range of 60 – 70 dbs. Some meat slicers, particularly those for commercial use, have parts which can be removed and cleaned very easily. There are some other models that may not come with such parts which are so easy to detach. S, before making a purchase, take into consideration the cleaning requirements of these complex machines. Looking for high precision cutting at higher speed? Look no more than this slicer, accurately named. If you are a chef and this is not your primary choice, then are you really one? 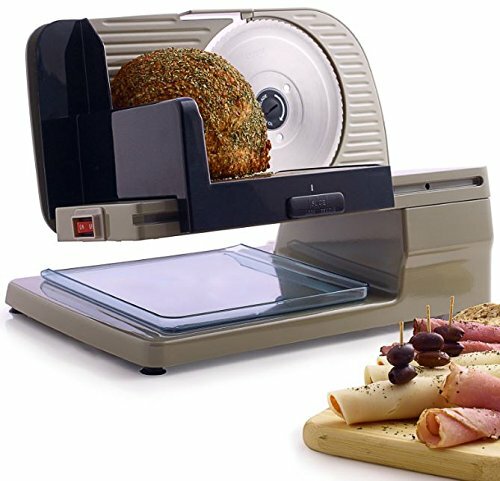 The Chef’s Choice slicer is dedicated to producing restaurant-quality, paper-thin slices of meat, bread and more! It comes with the best food pusher design featuring a non-slip grip to minimize accidents. And even though the unit is 120 watts, it produces super clean cuts fast and is really a quiet operator. The unit comes with removable parts, for easier cleaning. Carbon steel. Chromium-plated. This meat slicer from BESWOOD is designed for both commercial and home use. This thing comes with a massive 10-inch carbon steel blades which can cut through any type of meat, effortlessly! It is multi-purpose, too. Veggies and cheese? This slicer has no problem cutting them down! Featuring industrial-grade aluminum body, this machine is built to last long for generations. What I love about this slicer is that it is fitted with 2 whetstones at the top in order to keep the blade sharp all the time! The slicer uses high-quality V-belt which keep the vibration and noise to a minimum. In order to add an extra layer of protection against power shock, this slicer features a double-illuminated on / off switch. Featuring a blade ring guard, your hands should be safe when operating and the skid-proof rubber should keep the machine stead when slicing. Lastly, this meat slicer meets all U.S quality standards for safety such as ETL, NSF, and FDA. If you want a slicer that can cut through anything you want to cook, then you can’t just look past the KitchenWare Station Meat Slicer. It is perfect for anyone who takes the art of slicing seriously— whether at home or in their restaurants. This beast has more than enough power to slice through a selection of different types of foods while also keeping consistent results. Built to last, the slicer housing is made of aluminum alloy which is highly durable and less likely to corrode. 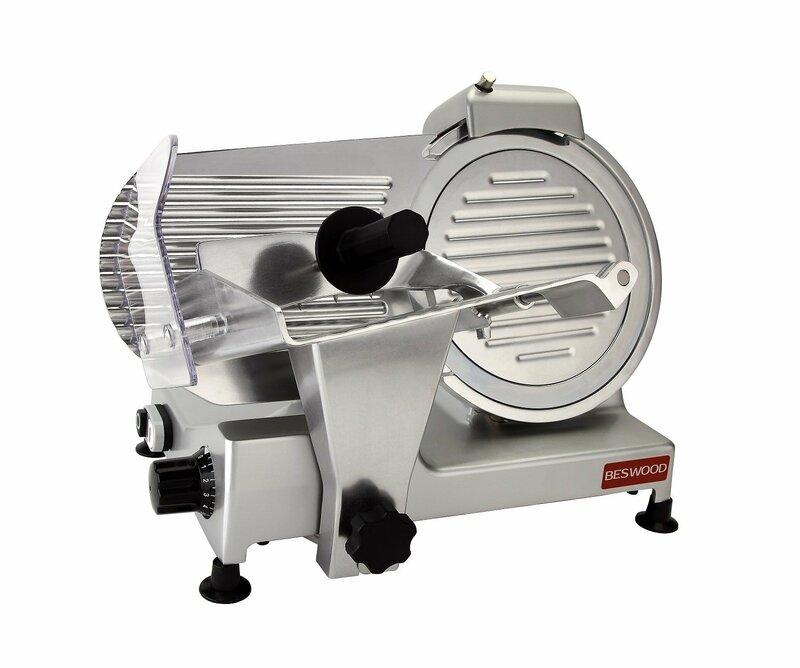 With a powerful but low noise motor and power transformer which can prevent short circuit and electric leakage, this slicer can slice meat at an extra fast rotary speed. Its 10-inch Teflon non-sticky stainless steel blade is extremely sharp an comes with a built-in sharpener that keeps the blade continuously hones and sharp for high precision slicing. Featuring large numerical scale knobs, you can easily make thickness adjustments. For added security, the machine boasts skid-proof rubber feet that will keep the machine stable and secure. It also has a ring guard protection to prevent cutting yourself and the on/off switch and relays are separately built to prevent from being damaged. Easy to clean, the machine comes with removable parts for your convenience. 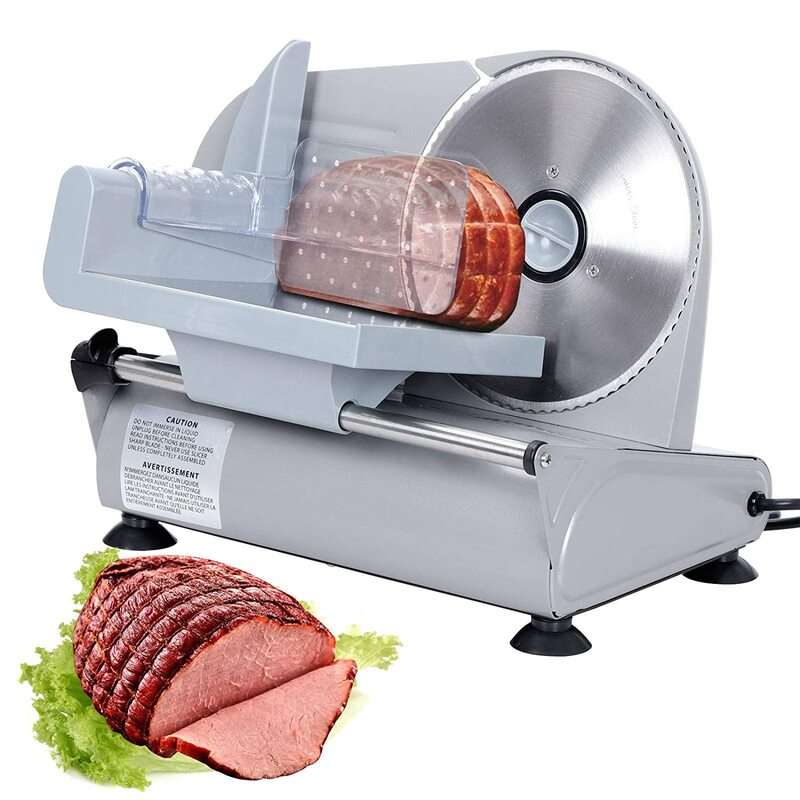 If you love to eat deli-style meat (like me) or you own a deli shop, then you will definitely love Amazon’s choice for “deli slicers for home”— the F2C Electric Meat Slicer! Solid and heavy duty construction, this slicer comes with die-cast aluminum and prime coated steel housing. Designed with spacious sliding food carriage, it is the perfect solution for home and professional chef looking for machines that can provide them nicely cut meats! Featuring a 7.5-inch stainless steel cutting blade, this rugged, yet sophisticated looking slicer offers you a high yield slicing power. Boasting an impressive 150 watts of power, it can slice through just about anything and comes with a cool running motor and reliable smooth gear drive for a continuous slicing operation. The built-in knob allows adjustments of thickness from 1/32” to ¾”. With a compact and sleek design, the small slicer can fit most home kitchen cabinets and countertops. Not only does it simplify your cooking needs, but it also simplifies the cleaning process, thanks to removable parts for easy cleaning. Now, this last item is very different than the rest. Why? Because this one is a manual meat slicer. Unlike other units on this list, this one requires your strength (not too much, though) to cut through meats and other food items. This manual meat slicer from WELOVE resembles a paper cutter and is operated like one. Just place the machine on a table and load the meat to the meat shelf. Grab the meat block with your left hand and using your right hand, use the handle to slice the meat into thin pieces. Made from premium stainless steel and a PVC handle, this meat slicer is durable, highly resistant to rust and completely waterproof. Thickness can also be adjusted from 0.2 mm to 25 mm. The unit comes with a replaceable high carbon steel blade, a sharpener, a spanner, 10 bags for rolling meat and a user manual. Meat slicers have really sharp blades in them. And it is not just about being careful when slicing meats. The, even more, trickier part is dealing with the blades while you clean the meat slicer. Using safety guards such as safety gloves while washing the blade is needed to avoid cuts on your hands. Most meat slicers come with a user safety manual. You need to read it carefully before using the machine. Make sure that the power button is off until the meat is ready to be sliced. Also, checking for any loose or missing parts is crucial to prevent the chances of malfunctioning. You also need to pay close attention to the surface on which the meat slicer is kept. The base of the slicer needs to be clear of any uneven surface as it may slip or turn upside down when operating. Like all kitchen equipment, it is essential that you clean your meat slicer thoroughly— for hygiene and prolonging the life of the machine. When you do not regularly clean your slicer, food residue can eventually build up in different parts of the machine which causes bacteria to grow. The bacteria buildup can contaminate foods and be the cause for foodborne illnesses, making you ill.
Additionally, a meat slicer can transfer small food particles or flavors onto foods you slice later, changing the texture and taste of your dishes. The slicer handle, blade guard and ring guard monitor should be monitored carefully for any broken, cracks, unattached or missing parts. Food particles accumulate under the slicer handle, inside the blade guards and at the ring guards. Also, make sure that you regularly examine seals and seams on your machine to see if they have worn away and created additional crevices where bacteria and leftovers can accumulate. Always follow the manufacturer’s instructions carefully. Wear protective gloves. Choose cut-resistant gloves such as cut-proof metal gloves are the best option. Never submerge the slicer completely. Never use steel wool since it can scratch the meat slicer. Set the thickness of your slicer to zero. Wipe both sides of the blade using a gentle scrub pad as the slicer is in motion. Once you remove any large particles, turn or and unplug the slicer. Make sure that the gauge plate is in a closed position and the whetstone is out of the way. Remove the product tray, center plate, and the product tray and wash and rinse these components. In order to clean the blade, you can leave it in place or remove it. If you leave the blade in place, clean it thoroughly. Alternatively, you can use degreasing spray in order to clan the blade. Clean both back and front of the blade while wiping from its center outward. Wipe down the exterior and remaining pieces. After that, rinse with hot water using a towel. Lubricating a meat slicer is just as important as cleaning. You need to keep the blade of the slicer well-oiled so it keeps a consistent and fast rotation. Regular oiling keeps the blade and the machine from rusting. The best oil for the job is a food grade machine oil. Stay away from vegetable and canola oil since these can turn the blade rusty and blunt. BESWOOD Premium Meat Slicer as the king of meat slicers! Designed for both home and commercial use, this is one durable machine that should last for a lifetime. Steel blades that come with its own sharpener, you can cut through anything and do not have to worry about dull blades. Other than that, this beast comes with all the safety features that you need! Whether you are hosting a meaty party or want to serve a meat dish, deli-style, a meat slicer should guide you through the easy path of preparation. Do you have any questions? Suggestions? Violent reactions? Feel free to voice up your concerns and hit the comment section below.